Addie (Jane Fonda) and Louis (Robert Redford) are two senior citizens who have been neighbours for many years. They both lead solitary lives after their spouses have died. Addie asks Louis to sleep in her bed every night to ease their mutual loneliness. They talk in bed together and reminisce on their families and relationships. The couple’s relationship becomes more complicated when the neighbours find out about them and Addie’s son arrives with her grandson in tow. Addie and Louis contemplate their growing attraction towards each other and what their future will bring. 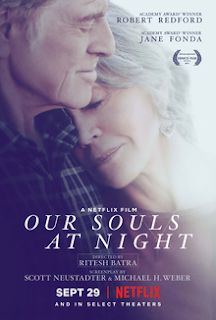 I liked how this film explored aging, relationships and isolation. While Addie and Louis had friends, both were lacking intimacy in their lives which made them lonely. Not just physical intimacy but having someone to talk to about their inner thoughts. It’s easy to forget that older people want those things too. I thought the romance between the two was interesting because of the maturity and life experience that they both had. Jane Fonda and Robert Redford played the characters with ease, having worked with each other before in four different films. I think they both gave an understated performance, as their characters were mild mannered people. The movie goes at a gentle pace, highlighting the staid lifestyle of the two main characters. They don’t do anything exciting, just go about their day in their small town. They both live in big empty family homes, with floors that creak just like their bones. However, when the two characters get together, they have more fun. Sometimes, things are just better with company. I wasn’t fond of the ending, but it was a happy ending. I would have liked the movie to end more triumphantly. I wouldn’t see this movie again, but I don’t regret watching it. I would recommend this is a movie to watch with your parents. The themes in this movie would be a good avenue for discussion.